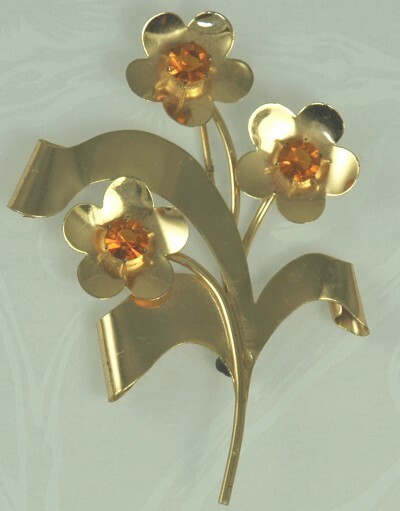 WAS: $60.00 NOW: $40.00 A beautiful gold vermeil over sterling spray brooch from Coro has three stems with flowers and three that look like ribbon. The ribbon look stems curve and curl under. The three flowers have prong set topaz colored rhinestones at their centers. This piece looks very similar to several Adolph Katz patents I found from this time period. The hallmark "Sterling Craft by Coro" appears on the reverse. Condition: Excellent vintage. Minor wear that is consistent with age mostly to the pin rod. There is a spot on the stem [reverse] that looks as if extra vermeil settled there. Measurements: 3" in long and 2" wide.